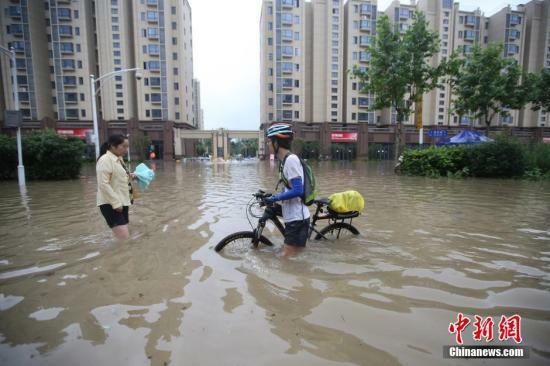 China’s local flooding problems this summer have finally risen to national focus. 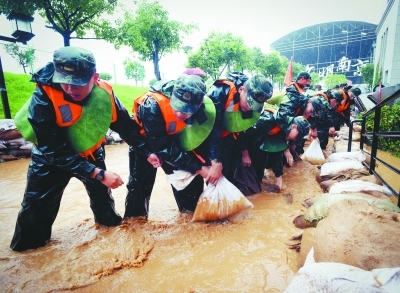 Today’s noon national news here led with the floods now inundating Anhui province, and concentrated much of their opening coverage on the threat of rising water levels in Nanjing, showing work being done to shore up berms and dikes along the Yangtze River. The opening section of the news coverage was devoted to dangers flooding poses to cities along China’s longest tributary, and the deaths and damage so far. That’s a change from previous national media coverage of the flooding. Local newspapers and media outlets were allowed to note the rising waters in their own specific areas, but the national news had instead been focused on the 95th anniversary of the founding of China’s Communist party and the contretemps in the South China Sea. State media largely treated the flooding as worrisome and unfortunate, but not a large-scale emergency that should lead the news. Accomplishments and dreams, not anxiety and potential nightmares, were the top stories of the day. No longer. There was an awkward moment at the start of the live portion of the noon broadcast when the military personnel were seen waiting for the filming to begin before actually starting to fill and toss sandbags. Both they and the on-site reporter deserved better treatment. But the blunder does reveal that Beijing wants the main storyline to be about it rescuing the provinces, a stirring struggle against nature that China will win because of the central leadership. As predicted, the situation locally is deteriorating. The sun made a brief appearance in the late afternoon here in Nanjing today, but it may turn out to be the only bright spot for a while. Residents are becoming increasingly disgruntled about the rain and the possibility of large-scale flooding. Nanjing and adjoining townships are seeing much higher water levels, as the rain continues and thunderstorms become more regular, especially during the overnight hours. There’s even talk of a typhoon hitting Jiangsu by the late weekend. There’s been substantial urbanization in and around Nanjing in the last few years, and what had been watershed and farmland that served to absorb heavy rain during previous floods is largely no longer available for that task. Nanjing isn’t overbuilt, but there are more than a few housing projects that are close to the Yangtze and the lower floors of those structures are certainly vulnerable, as are the various stores and other services that are part of those developments. For many locals in the latter category, their inventory represents their lives. Some urban residents voice concern that plans they made to vacation this month in China or elsewhere will be disrupted; others already note the jump in food prices and the disappearance of certain seasonal staples. For other residents, their vehicles are already vulnerable because many parking lots were hastily constructed to meet the demand for space for cars (and the fees that could be collected) and drainage an afterthought. All that may seem like minor issues when people’s lives and livelihood are at stake, but these are the sorts of matters that matter to many locals. Residents now at least are seeing military personnel marching off to do battle with the water, winds and waves, and that’s heartening. At the same time, it’s questionable whether the forces available this time around will actually turn out to be adequate. So much of southern China is already flooded, and with east China now under the same threat with more rain on the way, military relief is already hard-pressed. Compared to the floods of 1998 where soldiers performed heroically to save many cities and citizens, Beijing is going to have a tougher time this summer, if only because China’s armed forces has gotten smaller since then, and the shift to a more mobile military have emphasized the Navy and Air Force at the expense of the ground troops, who did the bulk of the work nearly twenty years ago. The broadcast at noon today showed 武警, troops of the People’s Armed Police (which answer to the central military command and are usually responsible for social order); many of the news photos appearing in today’s newspapers and local coverage are of the People’s Armed Police as well. That’s because they’re readily available--though they’re unlikely to be local, as the heightened tensions in the South China Sea have meant that certain garrisons (such as Nanjing’s) are gearing up for next week’s scheduled military exercises there. It’s not at clear where Beijing (or provincial governments) will turn if manpower starts to run short, or how what is available will get here if the flooding gets worse. 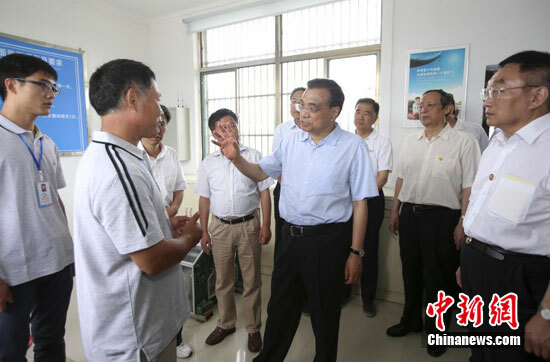 China’s Premier Li Keqiang flew into Anhui today to inspect the situation, and provide instructions to local officials. News coverage showed him giving orders, meeting with locals to receive their thanks for his attention to the flooding, and surveying the state of the regional waterways. In short, the standard political script many have come to expect from Beijing. Li’s local appearances are always presented as welcome occasions, though some cadres might wonder just how much when the Premier arrives to deliver directives and lecture subordinates about their purported shortcomings. Natural crises and the deployment of relief forces (including the military) are the responsibility of China’s State Council that Li chairs as Premier, so it’s only appropriate that he should take the lead in looking into the crisis. Still, Li’s reputation will be on the line, at a time when his stewardship of China’s national economy and his authority continue to be called into question by some. If Li does more than wade into the rising local waters to assist others and bolster himself, he’ll need to be careful that he’s not pulled under by the politics back in Beijing.